In the opinion of the author, one of the most beautiful birds. 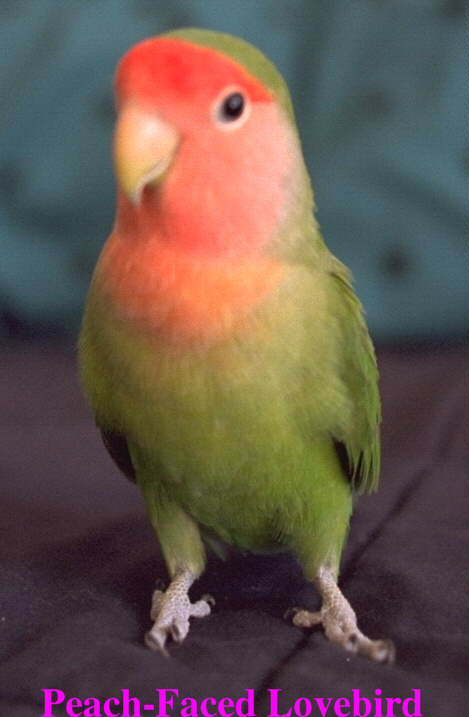 The bird is a light green, with a brilliant light-red face. The eyes are surrounded by a light white ring. Originally from Africa & Madagascar. The love bird has a high shrill call, and may 'call' often. As with most birds, if gotten while young, can be a very affectionate. Can be trained to talk. Not very loud, but voice is high and bird calls often. Prices usually fall under $50. The Colored Atlas of Lovebirds : Agapornis : More Than a Hobby, a Passion!